Save 20% Storewide This Weekend! 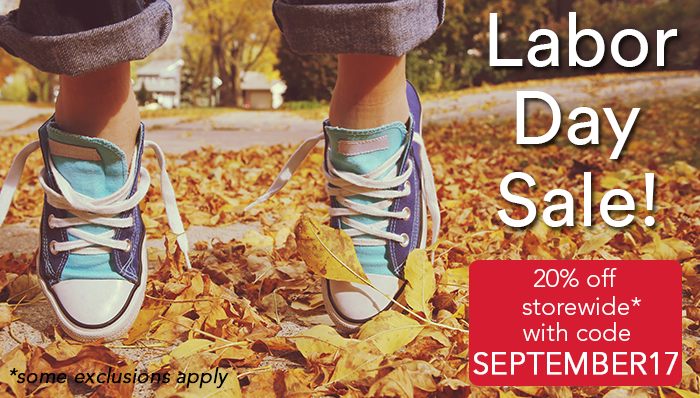 Jump into Fall with savings throughout our entire site! *Promotion is valid from September 1, 2017 at 12:00am ET through September 4, 2017 at 11:59pm ET. Promotion does not apply to items DRB 682, DRB 683, DRB 770, DRB 771, DRB 772, DRB 773, DRB 774, DRB 775, DRB 776, DRB 777, DRT 200, DRT 201, DRK 700, DRK 701, DRK 702, & DRK 703. Offer cannot be applied to previous purchases, combined with any other offers, transferred, refunded, or redeemed and/or exchanged for cash or credit. Different Roads to Learning reserves the right to change or cancel this promotion at any time. To redeem offer at differentroads.com, enter promo code SEPTEMBER17 at checkout. Written by: Different Roads to Learning on September 1, 2017. Last revised by: August 31, 2017. This entry was posted in ABA, Academics, Applied Behavior Analysis, autism, autistic spectrum disorder, Difflearn Promo Code, Sale and tagged ASD, autism, autism spectrum, autism spectrum disorder, promotions, sales, sales and promotions by Different Roads to Learning. Bookmark the permalink.